"TURRET, TRAINING TYPE A-8 FOR MODEL AT-11 AIRCRAFT"
I thought, 'wow, what a great gift. My very own gun turret. Just what every kid should have.' I then thought ‘what the heck is an AT-11?’ My Dad proceeded to explain to me that an AT-11 was a bombardier and gunnery trainer from WWII. The AT-11 was based on the Beech 18 but had a glass nose for the bombsight and a twin 30 caliber gun turret. It turned out that my dad and a buddy of his flew an AT-11off of Saipan in the South Pacific in 1945. They buzzed the control tower on the Japanese held island of Rota and made the lookouts jump from the tower. This is documented combat use of the AT-11! I set my mind to finding an AT-11 to go along with my new gun turret. 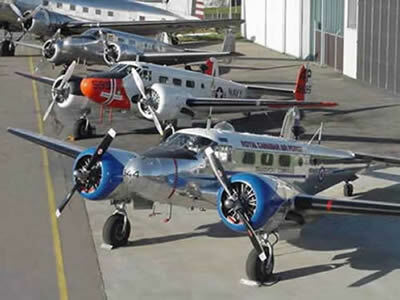 After the Christmas vacation was over, I returned to San Jose State’s Aeronautics Department where they had two old Beech 18's that were used as instructional airframes. I was sitting in the cockpit of one of the aircraft imagining what it would be like to own one of these someday. I noticed that the other Beech 18 had a large circle of rivets on the top of the fuselage. The rivet pattern was the perfect size for a turret. Since that Beech 18 had a standard round metal nose and didn't have a Plexiglas nose for a bombardier, I didn't think that it was actually an AT-11. I ran over to it and looked under the floorboards and found the turret mounting plate. This Beech was an AT-11 at one time and had been modified. My next stop was to see Professor Tom Leonard, the Department Chairman. As it turned out the department had just decided to get rid of the two Beech airframes and I was able to purchase the AT-11 for $250 without engines. Being the wealthy college student that I was, I had to borrow the $250 from my mother. I was now the proud owner of a 1942 Beechcraft AT-11. My first airplane! Life was good. AT-11 42-37403 N7351C...My first airplane! Little did I or my father know what an impact that Christmas gift would have on my life. 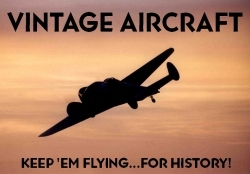 I began to learn all I could about the AT-11 and the Beech 18. Over the years since I have owned many Beech 18's. six AT-11's, One SNB-1 (Navy version of the AT-11), three UC-45J(SNB-5) and two RC-45J's (SNB-5P). I have turned that Christmas gift into a business that specializes in the Twin Beech and it's military counterparts. 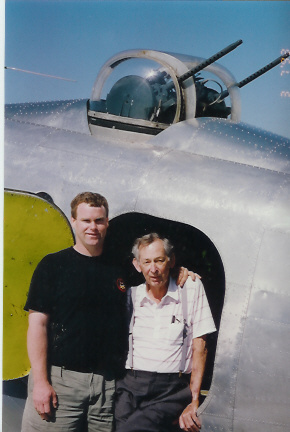 I was thankfully able to install the turret in the SNB-1and take my dad up for a flight before he died in 1994. He was thrilled to see his Christmas gift flying in an AT-11 again. I wish my Father could see the impact that his extraordinary gift had on my life. That gift along with some uncanny timing at San Jose State University directed me to where I am now with Vintage Aircraft and twinbeech.com. 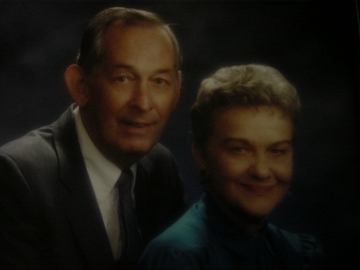 This is Henry J. Ramey Jr. and Alyce Ramey the best parents that ever lived! Thanks Mom and Dad, for giving me the most incredible opportunities that a kid could ever imagine.